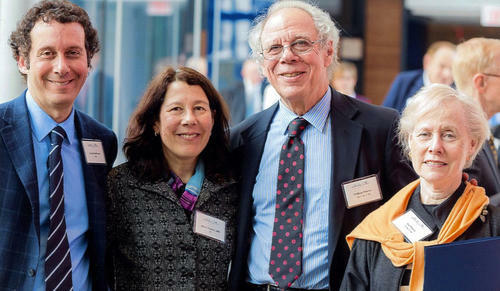 A gift from William ’56 and Lia Poorvu and their children Alison Poorvu Jaffe ’81 and Jonathan Poorvu ’84 has created a permanent endowment for the Center for Teaching and Learning, sustaining the activities of the pioneering center in perpetuity. In recognition of their generous support, the center has been named the Poorvu Center for Teaching and Learning. Originally established as the Center for Teaching and Learning in 2014, the organization moved into newly renovated space in Sterling Memorial Library in 2017. In its state-of-the-art, 24,000-square-foot location, the center has flourished as the university’s preeminent hub for teaching and learning and represents a new era in Yale’s commitment to pedagogical excellence. According to Frederick, the design of the space embodies the center’s core values: community, transparency, flexibility, and incubation. The hub of resources facilitates connections between different programs and populations, and promotes the dissemination and transfer of effective pedagogical approaches. The Poorvu family’s endowment provides a permanent source of support for the center’s core activities, which impact faculty and students in New Haven and learners around the world. The center facilitates effective course design and promotes evidence-based teaching methods for faculty members, graduate student teaching fellows, and postdoctoral scholars; and it supports student learning by offering tutoring resources in fields such as writing, science and quantitative reasoning, and academic strategies. Graduate and professional students also have access to resources that help them develop as scholarly writers. In addition, the center partners with faculty members across the university to disseminate Yale’s intellectual culture to alumni and other learners beyond the campus. Through a new partnership with the Yale College Dean’s Office, the center is also helping first-year students transition to college life. The First-Generation Low-Income (FGLI) Community at Yale offers social, institutional, and academic support for students who identify as the first in their families to go to college as well as students who report as coming from low-income communities. Students meet at the center two times per week to participate in a curated series of academic strategy workshops and conversations with FGLI peer ambassadors. The Poorvu family has longstanding legacy of philanthropy at Yale, much of it reflecting their interest in pedagogical excellence; together, Bill and Lia Poorvu combine 80 years of teaching in higher education. In 1991 they created the Poorvu Family Fund for Academic Innovation, which recognizes Yale’s strength in interdisciplinary teaching. Given to outstanding junior faculty members who have demonstrated excellence in teaching in interdisciplinary undergraduate programs, the award enables them to dedicate the summer to research essential to their development as scholars and teachers. Family members have also been active as university volunteers, with Bill and Lia Poorvu having served on the Yale Development Council (YDC); Alison Poorvu Jaffe and Jonathan Poorvu are current YDC members. Bill Poorvu was also a member of the Investment Committee as well as the University Council, an advisory body to the university president.